The Guilford Press, 9781462505395, 413pp. This trusted practitioner resource is acclaimed for its clear, compassionate, and hopeful approach to working with clients who self-injure. Barent Walsh provides current, evidence-based knowledge about the variety and causes of self-injurious behavior, its relationship to suicidality, and how to assess and treat it effectively. Illustrated with detailed case examples, chapters review a wide range of cognitive-behavioral interventions. Essential guidance is provided on tailoring the intensity of intervention to each client's unique needs. Walsh is joined by several colleagues who have contributed chapters in their respective areas of expertise. Reproducible assessment tools and handouts can be downloaded and printed in a convenient 8 1/2" x 11" size. *Incorporates up-to-date research and clinical advances. *Now uses a stepped-care framework to match interventions to client needs. *Chapters on the relationship between suicide and self-injury, formal assessment, family therapy, and residential treatment for adolescents. *Special-topic chapters on the "choking game," foreign body ingestion, multiple self-harm behaviors, and self-injury in correctional settings. Barent W. Walsh, PhD, is Executive Director of The Bridge of Central Massachusetts in Worcester and Teaching Associate in Psychiatry at Harvard Medical School. The Bridge specializes in implementing evidence-based practice models according to protocol in public-sector settings. It comprises over 40 programs serving persons with mental health or developmental disability challenges, including special education; residential treatment; wraparound services; supported housing services; a drop-in center for gay, lesbian, bisexual, and transgender teens; and a program for homeless people. A recipient of the Lifetime Achievement Award from the Massachusetts chapter of the National Association of Social Workers, Dr. Walsh has worked with self-injuring persons for over 40 years and has conducted research, written extensively, and presented internationally on self-injury. He has consulted on this topic at numerous schools, outpatient clinics, group homes, psychiatric hospitals, and correctional facilities, and has also served on the clinical and research faculties of the Simmons and Boston College Schools of Social Work. "Those working in the health and education scopes of practice with youth and young people will be well rewarded for the time they spend reading this book. Given the incidence of deliberate self-harm in the community, maybe this book should be added to the list of required reading for all those assessing and helping to manage risk within health services"
"Other books on self-injury are available, but none is so comprehensive in approaching treatment in a way that is extremely useful to mental health practitioners....An excellent manual...useful in clinical decision-making/m-/a must-have reference." "Walsh's clear explanations of the therapeutic models enable even beginning clinicians with little exposure to CBT to understand the origins and rationale for his approach, and then be able to apply the techniques in their work with clients." "Delivers what it says on the book cover: it is a practical guide....[Makes] a sometimes repellant subject engaging and readable, while never appearing voyeuristic or sensational....This text will be invaluable for any practitioner who works with patients who self-injure." 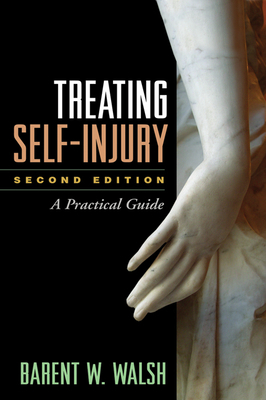 "[An] extremely practical guide to coping with self-injury. This book anticipates and guides the reader through the complicated multisystemic disasters that this symptom can set off....Reflects the years of experience and wise counsel provided since the 1970s by the Bridge of Central Massachusetts, where Walsh is director."